(Nanowerk News) While the moon's surface is battered by millions of craters, it also has over 200 holes – steep-walled pits that in some cases might lead to caves that future astronauts could explore and use for shelter, according to new observations from NASA's Lunar Reconnaissance Orbiter (LRO) spacecraft. The pits range in size from about 5 meters (~5 yards) across to more than 900 meters (~984 yards) in diameter, and three of them were first identified using images from the Japanese Kaguya spacecraft. Hundreds more were found using a new computer algorithm that automatically scanned thousands of high-resolution images of the lunar surface from LRO's Narrow Angle Camera (NAC). "Pits would be useful in a support role for human activity on the lunar surface," said Robert Wagner of Arizona State University, Tempe, Arizona. "A habitat placed in a pit -- ideally several dozen meters back under an overhang -- would provide a very safe location for astronauts: no radiation, no micrometeorites, possibly very little dust, and no wild day-night temperature swings." Wagner developed the computer algorithm, and is lead author of a paper on this research now available online in the journal Icarus. Most pits were found either in large craters with impact melt ponds – areas of lava that formed from the heat of the impact and later solidified, or in the lunar maria – dark areas on the moon that are extensive solidified lava flows hundreds of miles across. In ancient times, the maria were thought to be oceans; "maria" is the Latin word for "seas." Various cultures have interpreted the patterns formed by the maria features in different ways; for example, some saw the face of a man, while others saw a rabbit or a boy carrying a bundle of sticks on his back. The pits could form when the roof of a void or cave collapses, perhaps from the vibrations generated by a nearby meteorite impact, according to Wagner. However, he noted that from their appearance in the LRO photos alone, there is little evidence to point to any particular cause. The voids could be created when molten rock flowed under the lunar surface; on Earth, lava tubes form when magma flows beneath a solidified crust and later drains away. The same process could happen on the moon, especially in a large impact crater, the interior of which can take hundreds of thousands of years to cool, according to Wagner. After an impact crater forms, the sides slump under lunar gravity, pushing up the crater's floor and perhaps causing magma to flow under the surface, forming voids in places where it drains away. Exploring impact melt pits would pin down the nature of the voids in which they form. "They are likely due to melt flow within the pond from uplift after the surface has solidified, but before the interior has cooled," said Wagner. "Exploring impact melt pits would help determine the magnitude of this uplift, and the amount of melt flow after the pond is in place." Exploring the pits could also reveal how oceans of lava formed the lunar maria. "The mare pits in particular would be very useful for understanding how the lunar maria formed. We've taken images from orbit looking at the walls of these pits, which show that they cut through dozens of layers, confirming that the maria formed from lots of thin flows, rather than a few big ones. Ground-level exploration could determine the ages of these layers, and might even find solar wind particles that were trapped in the lunar surface billions of years ago," said Wagner. To date, the team has found over 200 pits spread across the melt ponds of 29 craters, which are considered geologically young "Copernican" craters at less than a billion years old; eight pits in the lunar maria, three of which were previously known from images from the Japanese Kaguya orbiter; and two pits in highlands terrain. The general age sequence matches well with the pit distributions, according to Wagner. "Impact melt ponds of Copernican craters are some of the younger terrains on the moon, and while the maria are much older at around three billion years old, they are still younger and less battered than the highlands. It's possible that there's a 'sweet spot' age for pits, where enough impacts have occurred to create a lot of pits, but not enough to destroy them," said Wagner. 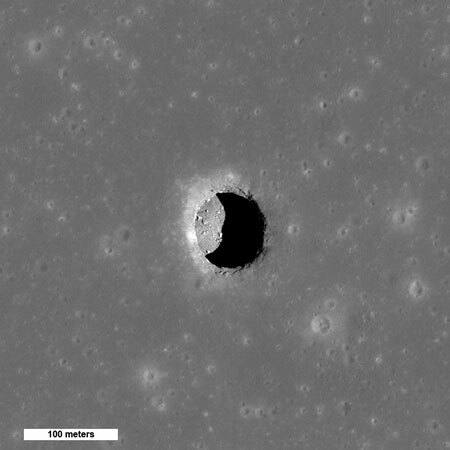 There are almost certainly more pits out there, given that LRO has only imaged about 40 percent of the moon with appropriate lighting for the automated pit searching program, according to Wagner. He expects there may be at least two to three more mare pits and several dozen to over a hundred more impact melt pits, not including any pits that likely exist in already-imaged areas, but are too small to conclusively identify even with the NAC's resolution. "We'll continue scanning NAC images for pits as they come down from the spacecraft, but for about 25 percent of the moon's surface area (near the poles) the sun never rises high enough for our algorithm to work," said Wagner. "These areas will require an improved search algorithm, and even that may not work at very high latitudes, where even a human has trouble telling a pit from an impact crater." The next step would be to tie together more datasets such as composition maps, thermal measurements, gravity measurements, etc., to gain a better understanding of the environments in which these pits form, both at and below the surface, according to Wagner. "The ideal follow-up, of course, would be to drop probes into one or two of these pits, and get a really good look at what's down there," adds Wagner. "Pits, by their nature, cannot be explored very well from orbit -- the lower walls and any floor-level caves simply cannot be seen from a good angle. Even a few pictures from ground-level would answer a lot of the outstanding questions about the nature of the voids that the pits collapsed into. We're currently in the very early design phases of a mission concept to do exactly this, exploring one of the largest mare pits." The research was funded by NASA's LRO project. Launched on June 18, 2009, LRO has collected a treasure trove of data with its seven powerful instruments, making an invaluable contribution to our knowledge about the moon. LRO is managed by NASA's Goddard Space Flight Center in Greenbelt, Maryland, for the Science Mission Directorate at NASA Headquarters in Washington.